The English-language app UHH global is aimed at international users. 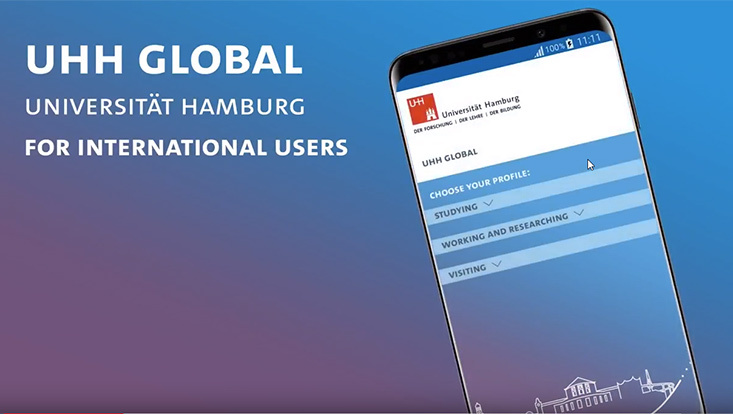 Whether you are an international student or prospective student, doctoral researcher or faculty member, or visitor to the University, UHH global offers a clear overview of the most important topics and rapid access to Universität Hamburg’s mobile services. UHH mobile is available for free for iPhones on the App Store and Android devices on Google Play! As an app provider Universität Hamburg takes data protection very seriously. All personal data is held in the strictest confidence according to legal requirements, as described in this privacy statement. To determine your location and provide directions through the Campus Navigator, the app requires access to the location services of your device. On request, the app determines your approximate location using GPS, Bluetooth, and crowd-sourced Wi-Fi hotspot and mobile phone mast locations to quickly send you information on your immediate environment. Data regarding your location is only used to process your request. This location data is transmitted to Google via an encrypted connection. You can change the permissions for access to your location services using the settings of your device at any time. When using the feedback function, your device information (device type and operating system) is determined and copied into the feedback email by your email client. This is a purely voluntary process which only occurs after you click the declaration of consent box. Your device information is only obtained after you have given your consent, and will only be sent to Universität Hamburg once you have actively sent the email through your email client program. This device information is solely used for processing your request and for resolving the problems described therein. By clicking the send button on the feedback email, your email address will be shared with Universität Hamburg by your email client program. Your email address will only be used to contact you, and will not be passed on to third parties. After processing your feedback, your email contents, email address, and device information will be deleted. Similar to UHH global, UHH mobile is available as a German-language web app, for iPhones, and for Android devices.